In a recent study, Han (2015) examines the little considered relationship between party polarization and income inequality. He shows that the correlation doesn’t exist in every case. Han concludes that institutional factors, for instance electoral system design, moderate the effect of income inequality on party polarization. Inspired by this finding, I examine the question, whether the electoral systems has an intervening effect on the correlation between party polarization and income inequality. Several factors, including income inequality, influence party positioning and also party polarization - the ideological distance between parties within a party system (Dalton 2008). According to the median voter redistribution model by Meltzer and Richard (1981), rising income inequality shapes the policy preferences of voters: poor voters with low income prefer higher taxes, because they gain most from redistribution and should thus prefer leftist parties. In contrast, rich people favour lower taxes, as they receive only little social benefits and thus support parties on the right of the political spectrum (Pontussen and Rueda 2010).With rising income inequality, vote-seeking parties have an incentive to move to a more extreme ideological position which results in higher levels of polarization. In contrast if income inequality decreases, parties react to the more moderate redistribution preferences of their voters and move to the centre. Hence party polarization decreases (Pontusson and Rueda 2008). Han (2015) shows, that the correlation between income inequality and party polarization doesn’t exist in every case. In some countries rising inequality lead to a higher party polarization, but in other countries, the relationship doesn’t exist or is negative. A possible explanation for this finding is the existence of institutional conditions (Curini and Hino 2012). In restrictive electoral systems with small district magnitudes, parties need the support of centre voters (Downs 1957; Cox 1990). Therefore, parties move to the centre and the party system is less polarized. In contrast, in permissive electoral systems with bigger magnitudes parties neglect the preferences of voters in the middle. They generate the biggest part of votes from their core supporters. Hence, parties change their positions towards a more extreme one. The party system becomes more polarized (Dow 2011). Based on my theoretical assumption, I formulate the hypothesis: The effect on party polarization is higher in electoral systems with bigger district magnitudes, if income inequality increases. For my analysis, I use a Time-Series Cross-Section estimation with panel-corrected standard errors for 24 OECD countries from 1960-2011. The dependent variable is the party polarization index by Dalton (2008), based on CMP data (Volkens et al. 2015). My independent variable for income inequality is the ‘1 per cent top income share’ (Solt 2009). To measure the permissiveness of the electoral system, I integrate the logged, average district magnitude (Bormann and Golder 2013). Table 1 summarizes the results of my estimations. 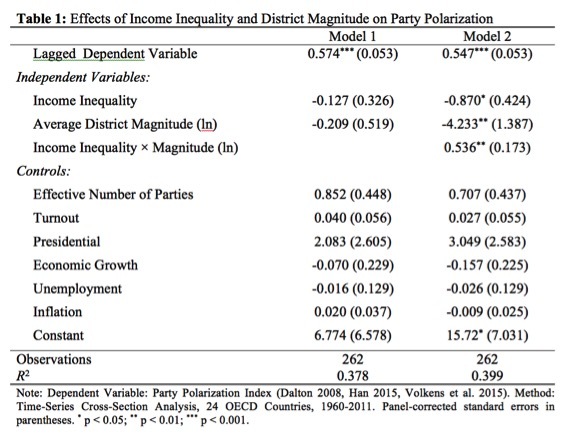 Baseline model 1 shows insignificant negative relationships between party polarization and income inequality and district magnitude respectively. Interestingly, the effects oppose the theoretical expectations. Model 2 includes the interaction term between inequality and district magnitude. The interactive effect is positive and significant suggesting that the effect of income inequality on party polarization is affected by the district magnitude. Figure 1 shows the marginal effect of income inequality. The figure illustrates, that starting from a district magnitude of 20 (district magnitude (ln) = 3) the effect of income inequality is positive and significant. This confirms my hypothesis. As district magnitude increases, the effect of income inequality becomes stronger. 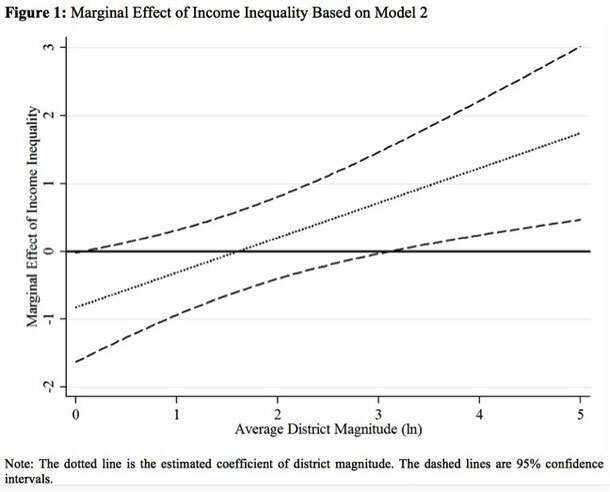 Vice versa, in very small district (district magnitude = 1; district magnitude (ln) = 0), the effect of inequality is negative. This means, that the party systems in countries with more restrictive electoral systems are less polarized if income inequality increases. In a nutshell, my findings suggest that, if income inequality rises, parties move to extreme position, but only under certain conditions. Less proportional electoral systems moderate the effect and seem to prevent radical movements. Parties do not seem to have an incentive to move to a more extreme position to solute the rising problem of unequal distribution of income if district magnitude decreases. The incentive to gain seats in less proportional system seems to inhibit a radicalization. Beramendi, Pablo and Christopher J. Anderson (2008): Democracy, Inequality, and Representation. A Comparative Perspective, New York: Russell Sage Foundation. Bormann, Nils-Christian and Golder, Matt (2013): Democratic Electoral Systems Around the World. 1946-2011, in: Electoral Studies 32 (2), 360-369. Cox, Gary W. (1990): Centripetal and Centrifugal Incentives in Electoral Systems, in: American Journal of Political Science, 903-621. Curini, Luigi and Airo Hino (2012): Missing Links in Party-System Polarization. How Institutions and Voters Matter, in: The Journal of Politics 74 (2), 460-473. Dalton, Russell J. (2008): The Quantity and the Quality of Party Systems. Party System Polarization, its Measurement, and its Consequences, in: Comparative Political Studies 41 (7), 899-920. Dow, Jay K. (2011): Party-System Extremism in Majoritarian and Proportional Electoral Systems, in: British Journal of Political Science 41 (2), 341-361. Downs, Anthony (1957): An Economic Theory of Democracy, Boston: Addison-Wesley. Han, Sung Min (2015): Income Inequality, Electoral Systems and Party Polarisation, in: European Journal of Political Research 54 (3), 582-600. Meltzer, Allan H. and Scott F. Richard (1981): A Rational Theory of the Size of Government, in: Journal of Political Economy 89 (5), 914-927. Pontusson, Jonas and David Rueda (2008): Inequality as a Source of Political Polarization. A Comparative Analysis of Twelve OECD Countries, in: Beramendi, Pablo and Christopher J. Anderson (ed. ): Democracy, Inequality, and Representation. A Comparative Perspective, New York: Russell Sage Foundation, 312-353. Pontusson, Jonas und David Rueda (2010): The Politics of Inequality. Voter Mobilization and Left Parties in Advanced Industrial States, in: Comparative Political Studies 43 (6), 675-705. Solt, Frederick (2009): Standardizing the World Income Inequality Database, in: Social Science Quarterly 90 (2), 231-242. Volkens, Andrea, Pola Lehmann, Theres Matthieß, Nicolas Merz, Sven Regel und Annika Werner (2015): The Manifesto Data Collection. Manifesto Project (MRG / CMP / MARPOR). Version 2015a, Berlin: Wissenschaftszentrum Berlin für Sozialforschung (WZB).